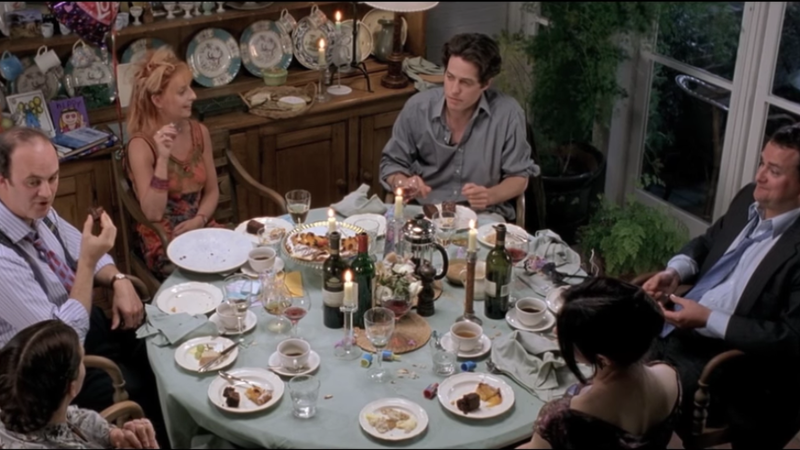 At a dinner party or a family-style meal out, who gets the last piece of food? In this excerpt of the dinner party how-to book Brunch Is Hell, Rico Gagliano and Brendan Francis Newnam lay out the three typical bad solutions (no one eats it, everyone shares tiny bites, an "alpha guest" hogs it), then present a witty five-point plan for awarding the last piece. Their proposals are all cute, but they don't really call for much ceremony, so they might come off a little blunt in person. Shockingly, none of them use the Notting Hill solution: Hold a little contest right at the table. The person with the saddest story wins the last piece of food. Real people don't bounce back quite as fast as romantic comedy characters, so you might want to tone this down to, say, "the saddest story from this week." You could really make it anything you want, but self-deprecation is always a winner. Not only does this turn the last-bit ritual into an activity, it also helps amp up the intimacy as the guests move from dinner to drinks. I'm required by law to point out that the last bit of food is called, in Spanish, la de la vergüenza or "the one of shame". And honestly, if you drop that little fact at the end of a dinner, you can probably just grab that piece without a contest.